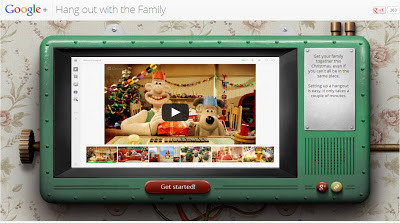 This year Google are promoting Google+ Hangouts as a means for family to get together over Christmas with a special site at http://familyhangouts.withgoogle.com showing people how to connect via Google Hangout. Google have also enlisted the help of children's characters Wallace & Gromit who feature in a promo video and star in personalised Google Hangout invites that can be sent to family and friends through the http://familyhangouts.withgoogle.com site. Nicely done and something that could well drive usage of Google Hangouts over the holiday season!